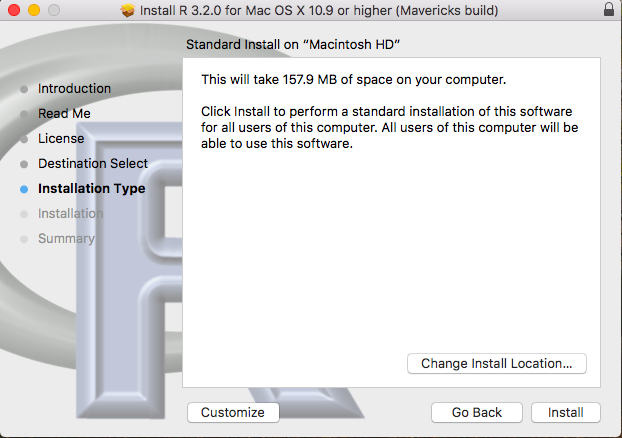 This document details the instructions on how to install R for Windows and Mac Operating Systems. R does not require any activation key, so do not worry about obtaining one. Locate the "R-x.x.x-win.exe" file that you downloaded from the Campus Software Library and double click on it to open it. It should look like the file below, although the name may vary depending on the version of R you downloaded. 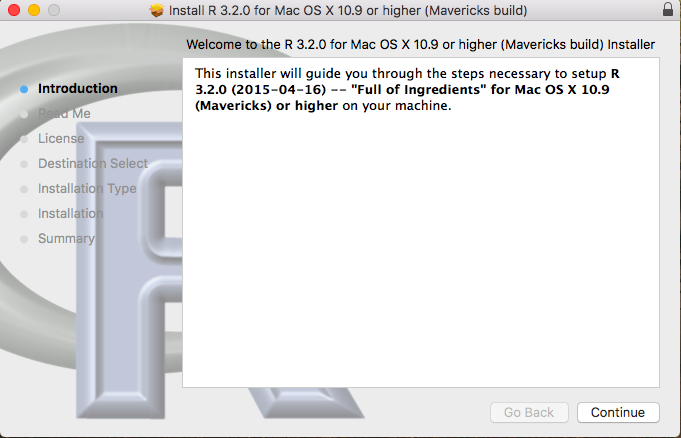 Click the "Run" button to run the R installer. You may be prompted by User Account Control - just click the "Yes" button to continue. 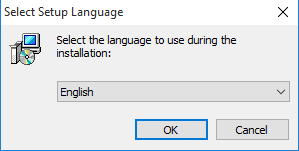 Choose your preferred language, and then click the "OK" button. 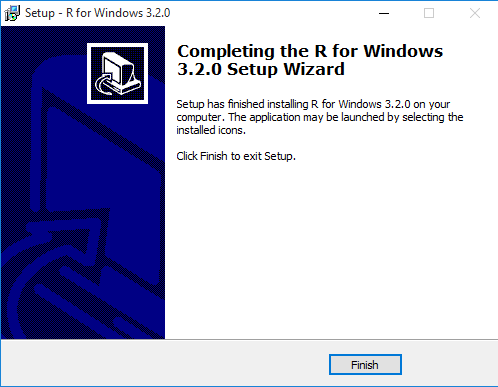 The R installation wizard will then begin. Click the "Next" button to continue. You will be presented with some information about R. Click the "Next" button to continue. Leave the Installation Destination Location field as it is by default, and click the "Next" button. The Select Components window will now appear. Leave the dropdown menu at "User installation", and then click the "Next" button. The Startup options window will now appear. If you want to customize the startup options, choose the "Yes" radio button, otherwise choose "No" and then click the "Next" button. The Select Start Menu Folder window will now appear. 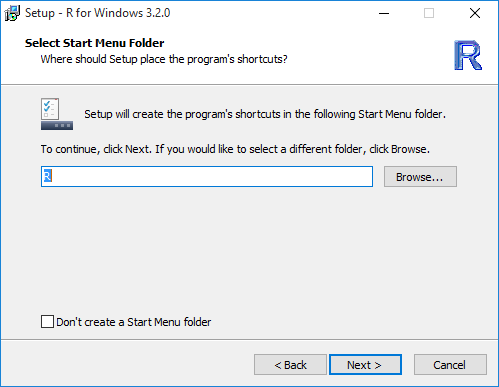 If you want the program's shortcuts to be in a custom Start Menu folder, then change the location by clicking on the "Browse" button and choosing your desired folder. If not, leave the text box as it is by default, and then click the "Next" button. The Select Additional Tasks window will now appear. 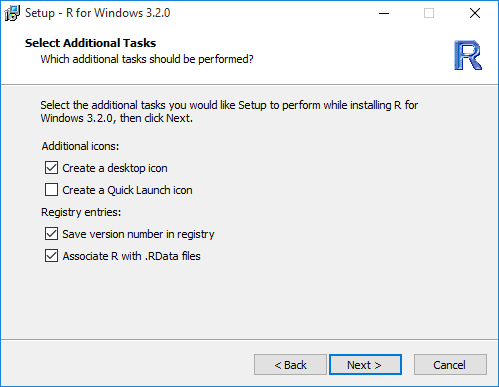 Under "Additional icons:", check either of the two boxes depending on whether or not you would like an icon for R on the desktop, or an icon for R in the Quick Launch menu. Under "Registry entries:", leave the two boxes checked and then click the "Next" button. The Setup Wizard for R is now complete. Click the "Finish" button to finish the installation. 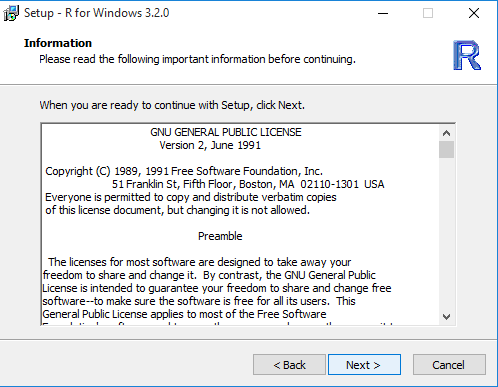 R should now be installed on your computer and ready to be used. 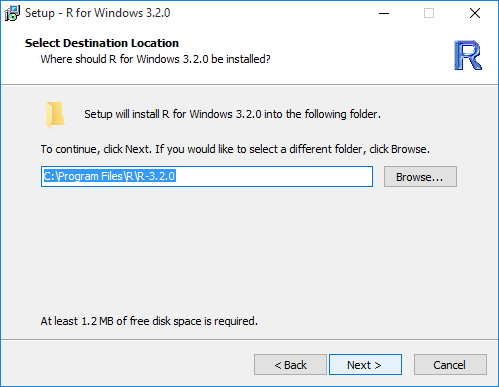 Locate the "R-x.x.x.pkg" file that you downloaded from the Campus Software Library similar to the file below, and double click on it to begin the installation. 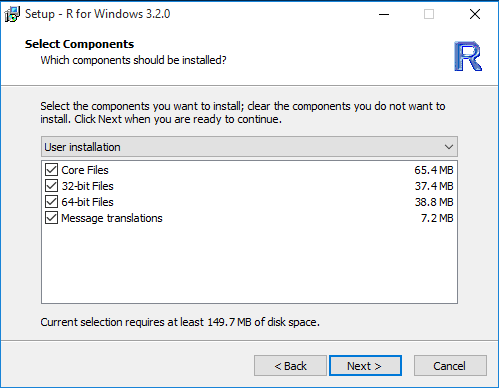 The R Installer window will now appear. Click "Continue" to continue with the installation. The Read Me window will now appear that describes the program requirements and other information. Click the "Continue" button to continue. 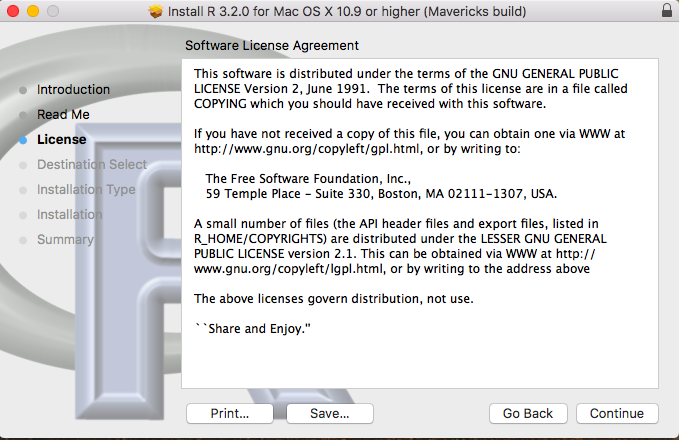 The Software License Agreement window will now appear. Click the "Continue" button to continue. 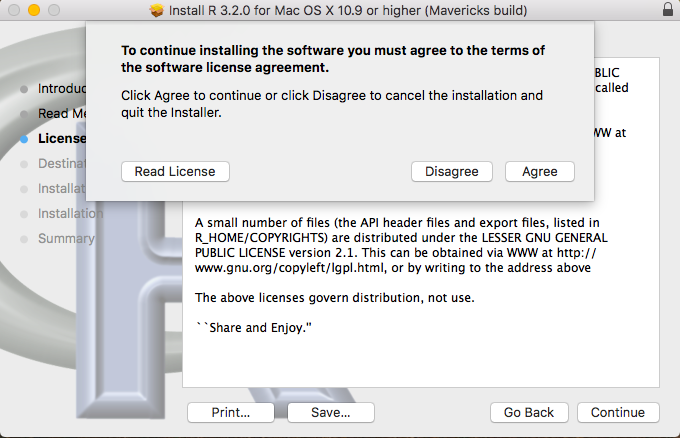 A smaller window will now appear asking you to agree to the software license agreement. Click the "Agree" button to agree to the agreement and continue. The Installation Destination window will now appear. By default the "Install for all users on this computer" option will be selected. 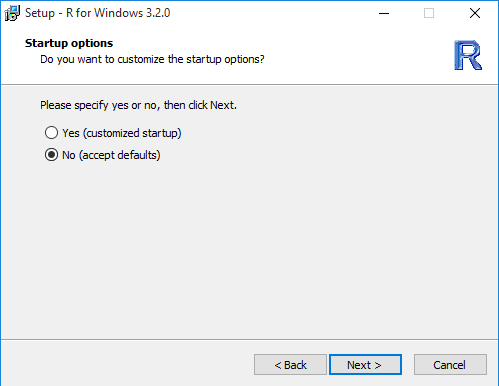 If you would like to install R on a specific disk, choose the other option and then choose that disk. Click the "Continue" button to continue. The Installation Type window will now appear. 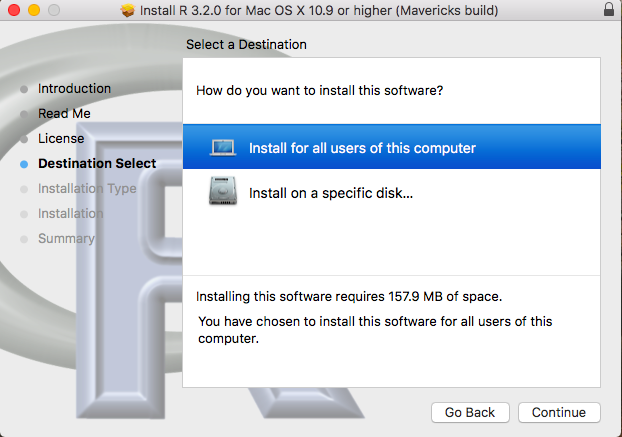 By default, R will install on your Macintosh HD drive. Click on the "Change Install Location" button if you would like to change this. Click the "Install" button to begin the actual program installation. 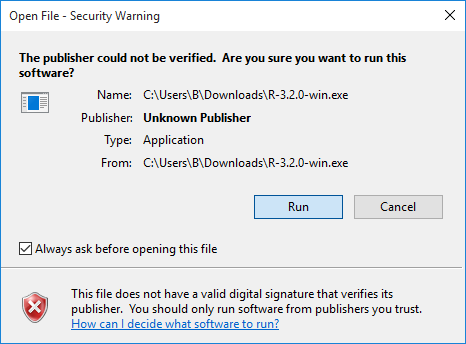 A smaller window will now appear asking you to authenticate the new program installation. 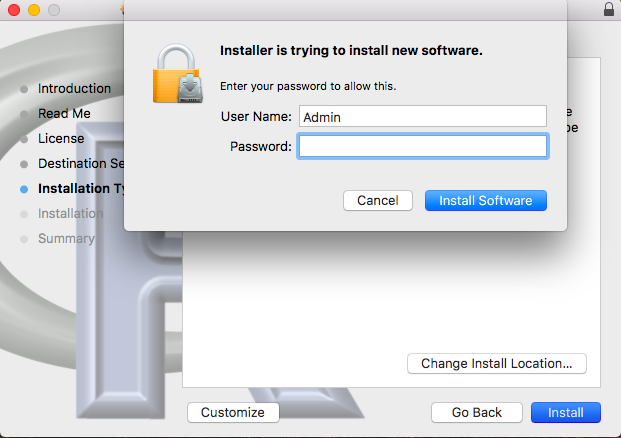 Enter your computer's Username and Password here, and then click the "Install Software" button. 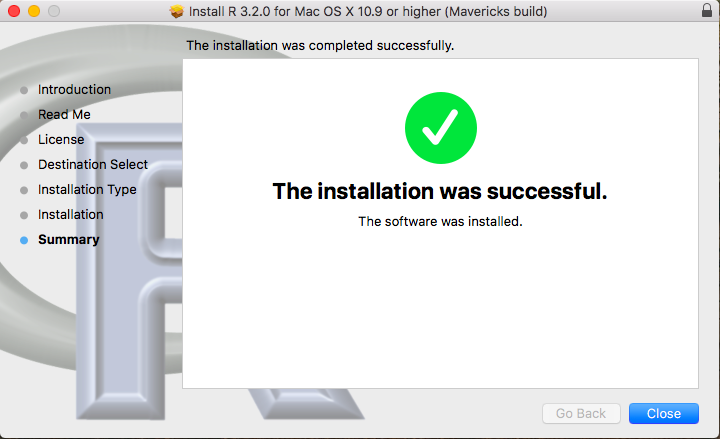 The installation of R will now begin. This may take 5 minutes or so. Once the installation is complete, you will be shown the window below. Click on the "Close" button to continue. 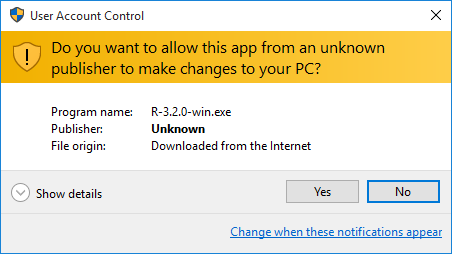 A smaller window will now appear, asking if you would like to move the R installer to the trash. 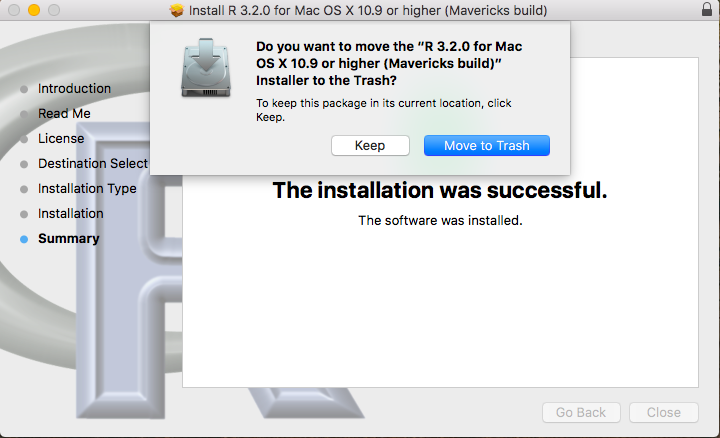 Click the "Move to Trash" button, as the installer is no longer needed since the program has been successfully installed. 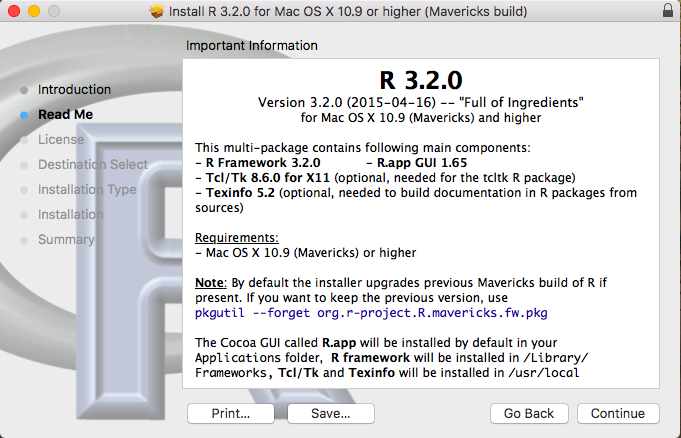 R is now successfully installed on your Mac. The program can be found in your Applications folder.